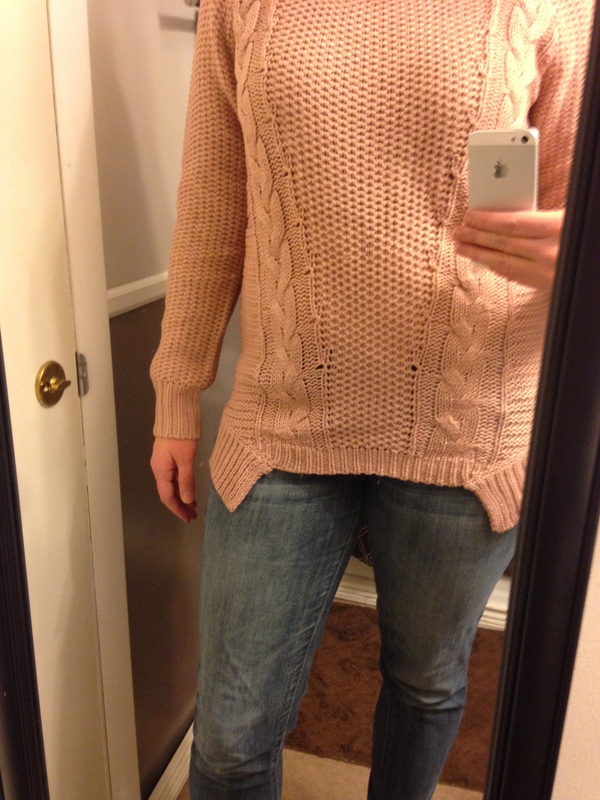 I suppose I need to join the cool kids and post a review about my experience with Stitch Fix, right? 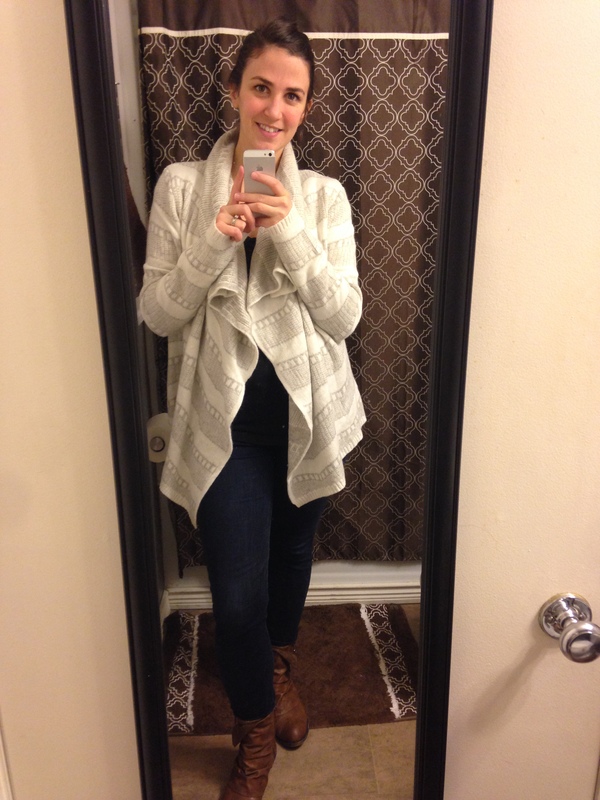 I’m a total newb in the Stitch Fix game and am terrible when it comes to fashion, but hey, why not write up an entire post about it? Stitch Fix, for those who don’t know, is an online service where you set up a profile, pay $20 and have a personal stylist send you five curated items they think will suit your needs/wants. Once they arrive, you get three days to try things on, mix-and-match with items from your own closet, and decide what you want to keep. If you keep anything, your $20s up front goes toward your final total; if you keep everything, you get a 25% discount on the entire box. It’s super easy and, if you’re like me and hate to shop, easy is what you need when you need new clothes. Make sense? Also, if you sign up through any of the links in this post, I’ll get a $25 credit without costing you anything extra, so that’s pretty awesome. OK — on to the fix. First up: Ooh, how pretty! Such a nice, neat little package. I had asked in my style profile for a big, oversized cardigan (hello, cold office), so seeing all the knits in this box was a good sign. Definitely off to a good start. 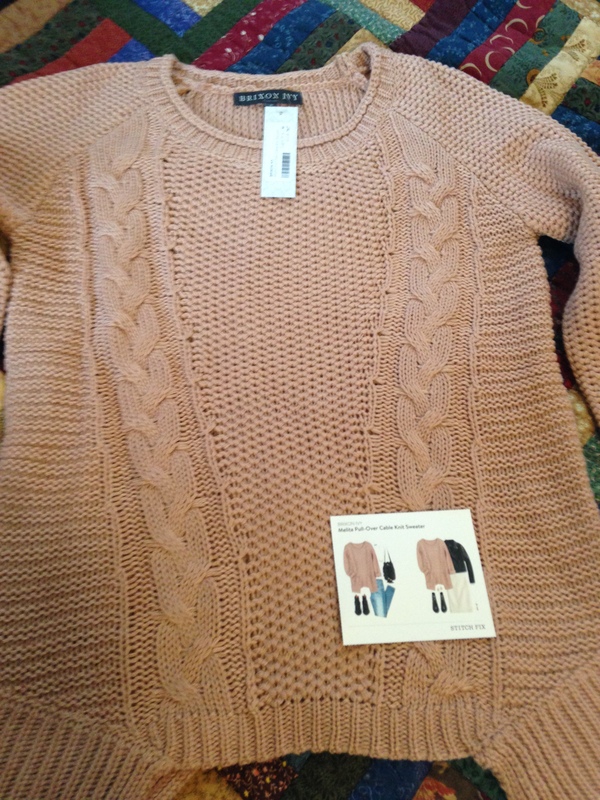 First up, this pink/mauve cable knit sweater. Hmm… that’s an interesting hem. Yeah, no. 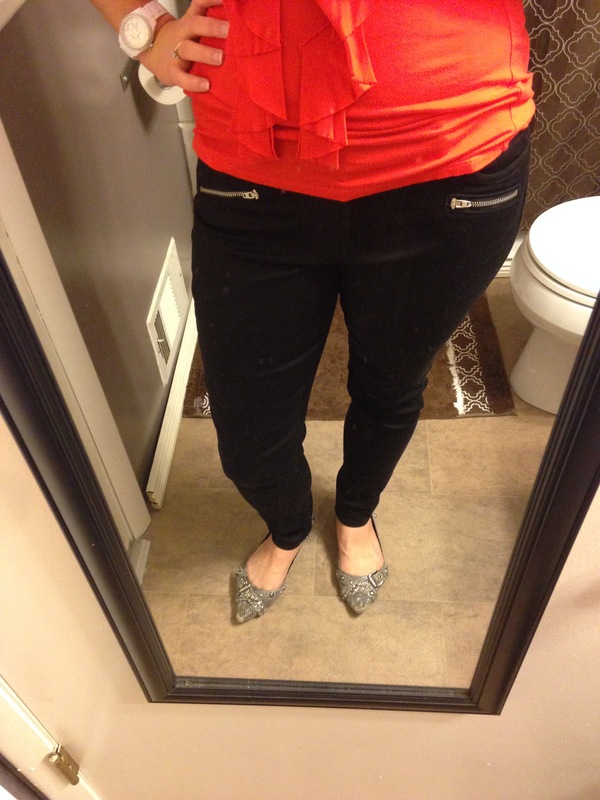 The fit on me was super frumpy, the little side flaps (I mean, what else would you call them?) we’re a little too weird for me. And since I decapitated myself in this pic you can’t tell, but the mauve doesn’t do much for my skin tone. Cost: $68. Verdict: Sent back. 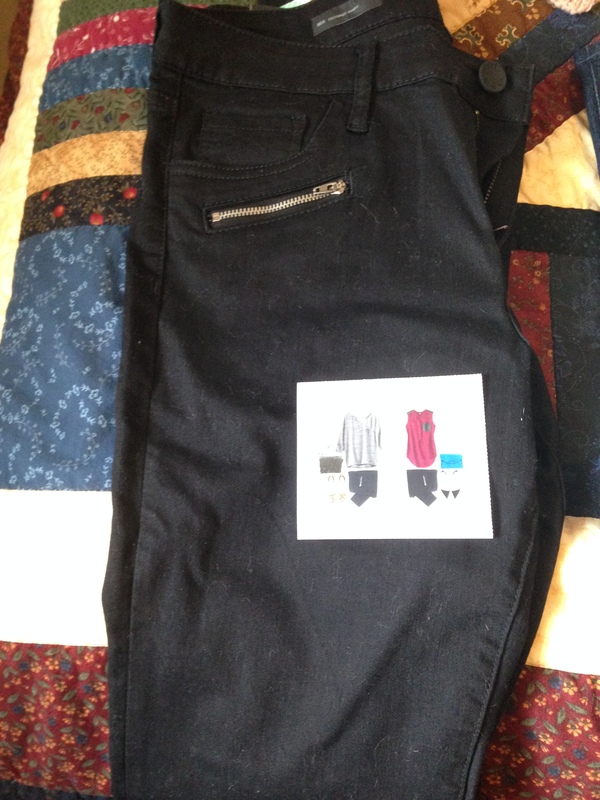 Next up, these super cute skinny jeans. At first glance I really liked these jeans. They were super soft and I kinda liked the funky-ness of that zipper detail. Look at me, following directions! I took a cue from the style card and paired them up with a bold-colored top and some snakeskin flats. I liked the look a lot, but ultimately, the fit was a bit off. Cost: $88. Verdict: Sent back. 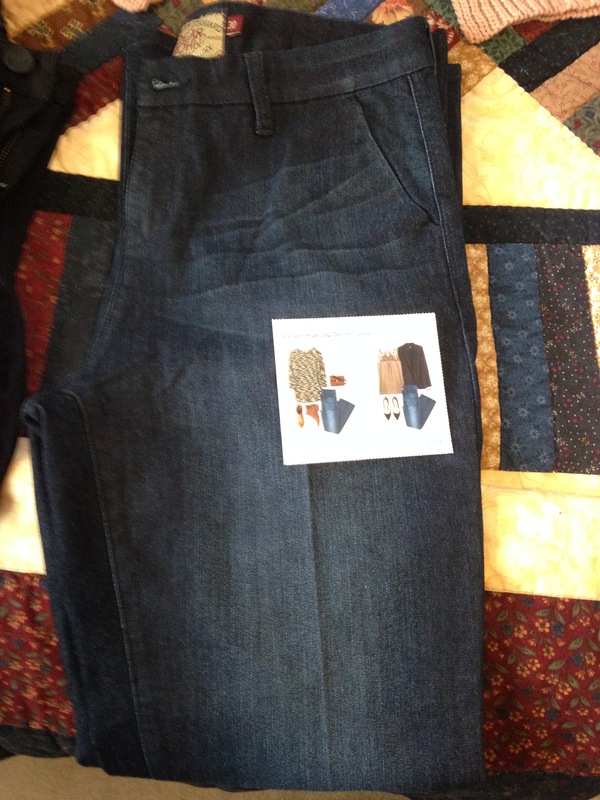 Man, I really need some jeans though, and they sent me two pair. Next up, these wide-leg trouser jeans. In theory, I really liked these jeans. I like that they’re a little nicer than your average denim, and the creased front makes them more like a pair of trousers. Oh right, that’s why they’re called trouser jeans. Anywho. 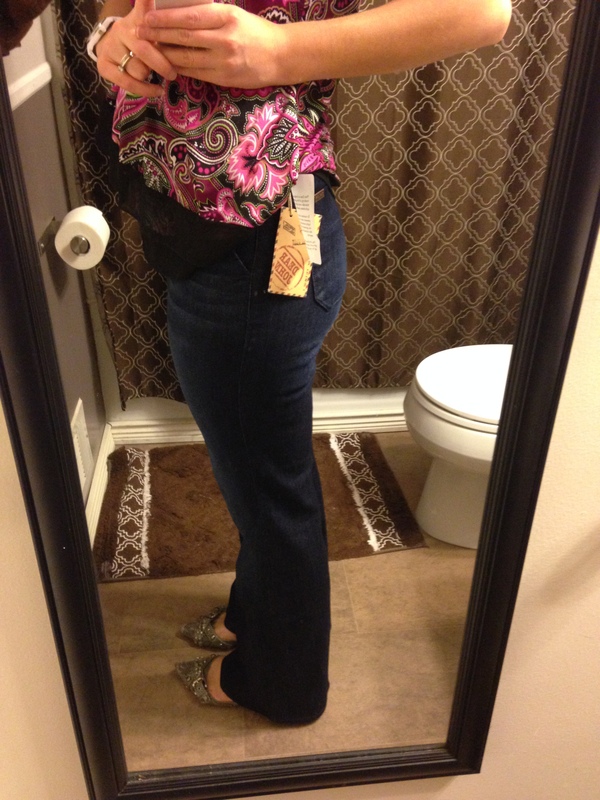 For the most part, I really liked these jeans. I had a bit of an issue with how they fit around the waist (just a smidge too big). And for nicer jeans, I’d want them to be a bit longer so I could wear them with heels; these are just long enough on me for flats. Darn. Cost: $78. Verdict: Sent back. Now, before you go thinking I sent back everything, I saved the best two for last! 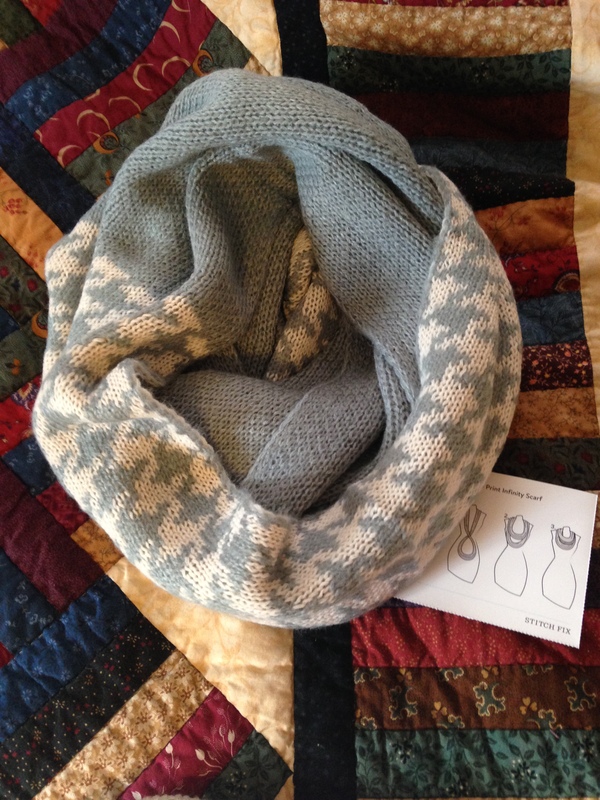 To infinity (scarf), and beyond! Let’s pretend I didn’t just caption it that. 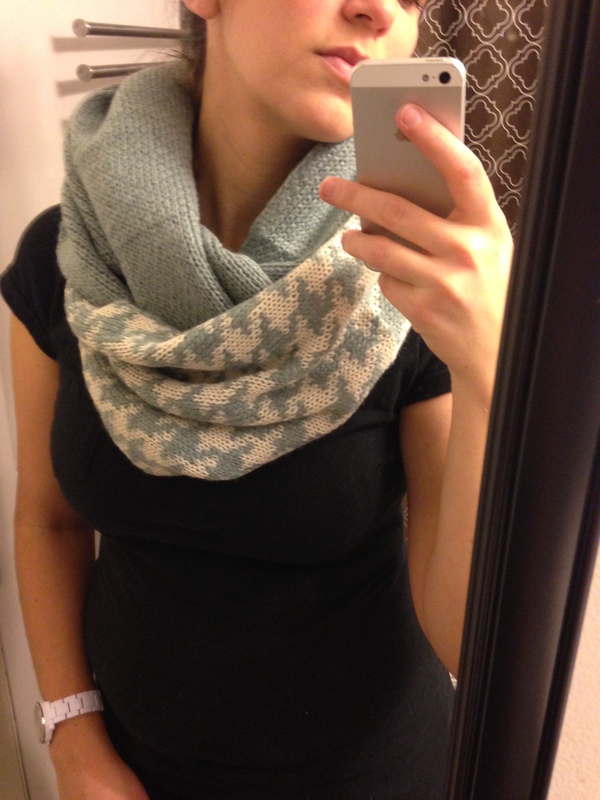 This scarf was super cute, a bluish-green color that I don’t own much of, and so, so snuggly. Paired with a simple tee and some jeans, we’re good to go! 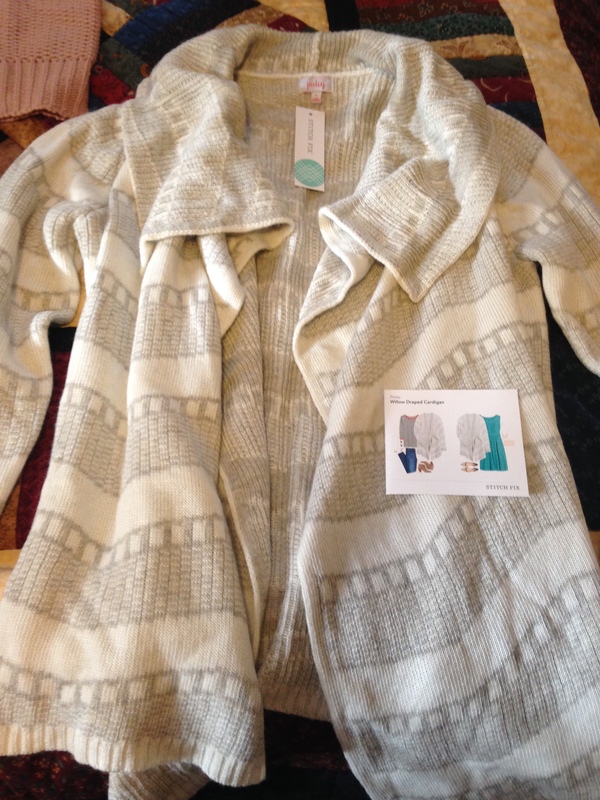 And finally, the cardigan I begged for requested! I spent hours — nope, not exaggerating — trying to find this mystical cardigan. Something big, warm and soft I could wear to work. Our office is freezing, FREEZING, and I’m usually at my desk wearing gloves and a coat because none of my cardigans are heavy enough. This scarf fits the bill. It’s super soft and warm enough to wear sans-coat, even now when it’s in the low 40s. There was no question, this one was a keeper. 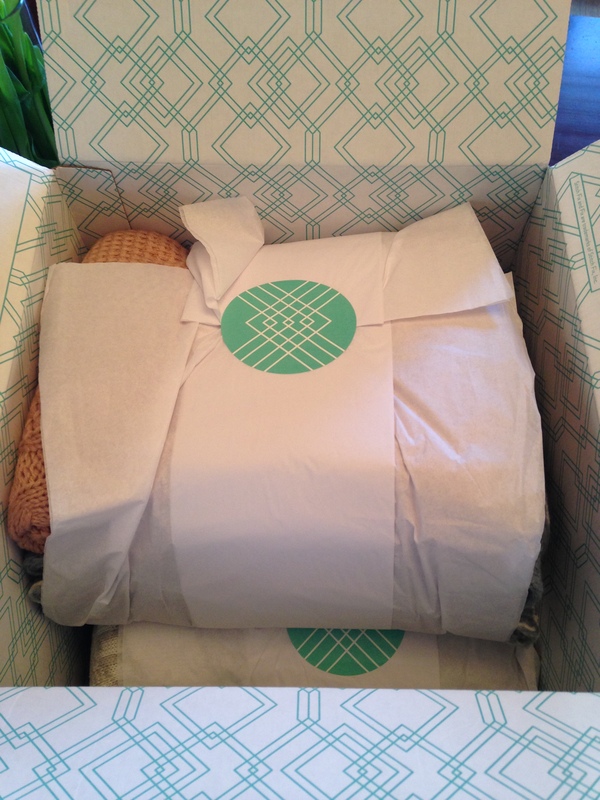 So there you have it, my very first Stitch Fix! I know I’ll definitely give it another go, as I loved the convenience of being able to try stuff on with what I already own, not to mention having someone else make the selection decisions for me. That scarf is really cute! Loved reading your review.